The quarry has been leased to the Centre for over 30 years from a local landowner and has been reopened following completion of works, funded by the Department for Communities, to improve accessibility and safety. Major changes and developments made to the facility include the as clearing and stabilising of the quarry floor, levelling of the quarry base and the installation of a new a hand-cable on a steeper section of path. TNOC, which is funded and managed by Sport Northern Ireland, is celebrating fifty years of providing skills and leadership training. For half a century, the centre has been providing lovers of the great outdoors with courses in seakayaking, mountaineering, orienteering as well as mountain biking against the natural and breathtaking backdrop of the Mourne Mountains. The enhanced climbing facilities at Altnadue Quarry will provide climbers of all abilities with the opportunity to learn new skills and train for competition. 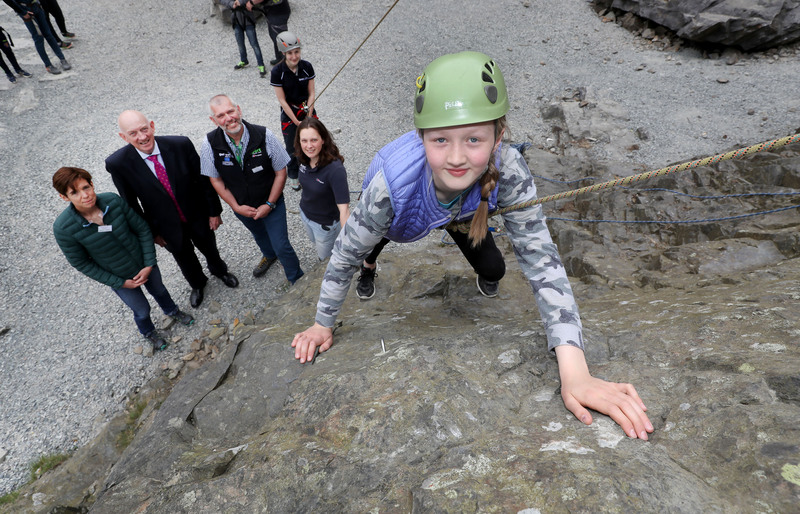 Opening the upgraded facility, Sport Northern Ireland Chair George Lucas said “2018 is proving to be an exciting year for Tollymore National Outdoor Centre as it celebrates fifty years of operation. With climbing set to become an Olympic sport for the first time in 2020, we are delighted to be launching this enhanced facility, which will be well used by individuals, clubs, charities and commercial providers of outdoor activities. The quarry will also play a part in delivering the NI Outdoor Recreation Plan with partners in the NI Environmental Agency and Tourism NI to promote and develop outdoor recreation here. Tony Murphy, at the Department for Communities Sports branch said; “The Department for Communities welcomes the opening of the new Rock Climbing facility at Altnadue Quarry. Investment of £170,000 enhanced safety at the site with improved access and new off road parking and it further compliments the existing facilities for the climbing and mountaineering sector and for local outdoor activity providers. Pictured at the launch: Joanne Curran, Consarc Architects, George Lucas, Sport Northern Ireland, Chair, Mike McClure and Emma Thompson Tollymore National Outdoor Centre with Eabha Hallissey from Newcastle Primary School and Sinead Murray, Tollymore National Outdoor Centre belaying in the background.